KANSAS CITY, Mo. (AP) — The only thing missing from the Chiefs’ rout of the Jaguars on Sunday was discipline. The Chiefs forced five turnovers on defense, returning one of Blake Bortles’ four interceptions for a touchdown. Their high-scoring offense gained more than 400 yards behind Patrick Mahomes‘ efficient air assault and Kareem Hunt’s hard running. And their special teams were simply steady. But a little of that shine was dulled by the ejections of defensive tackle Chris Jones and pass rusher Dee Ford, both in the second half of the Chiefs’ 30-14 victory . 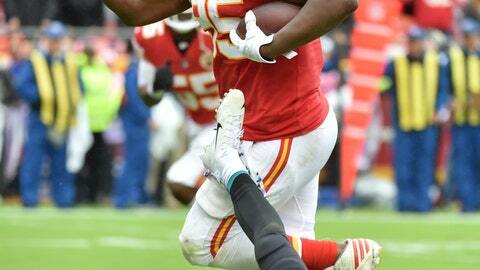 Jones, whose pick-6 electrified Arrowhead Stadium earlier in the game, was crushed to the ground as Jacksonville attempted an extra point. For no apparent reason, Jones drove his right elbow into the thigh of the Jaguars player beneath him, right in front of an official a few yards away. Ford’s ejection was a bit less egregious. He was flagged twice for unsportsmanlike conduct, the second of which came for standing over Bortles after chasing him into the Kansas City bench area. Jones and Ford were both absent from the locker room after the game. Especially considering the Chiefs (5-0) visit New England next weekend. The Jaguars (3-2) also were chippy throughout the game, but they at least had reason to unload their frustration. Bortles and the offense struggled with turnovers, and a defense that was ranked No. 1 in the NFL coming into the game watched Mahomes, Hunt and the rest of the Chiefs move the ball at will. In truth, the Chiefs made a solid argument that they’re also the best team. If not for the ejections, they would have done it to perfection on Sunday.